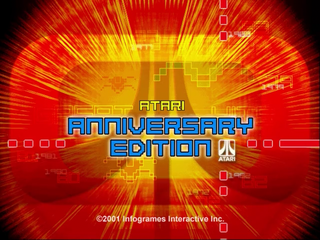 Atari Anniversary Edition is a compilation of 12 arcade games developed by Atari. As well as containing emulated versions of Atari's arcade classics, there are also "enhanced" options which enhance the graphics and various bonus features such as interviews with Nolan Bushnell, Atari's founder. None of the games included were released on Sega platforms on their own, however previous compilations such as Arcade's Greatest Hits: The Atari Collection 1 and Arcade Smash Hits contain several of these games. Main article: Atari Anniversary Edition/Magazine articles.